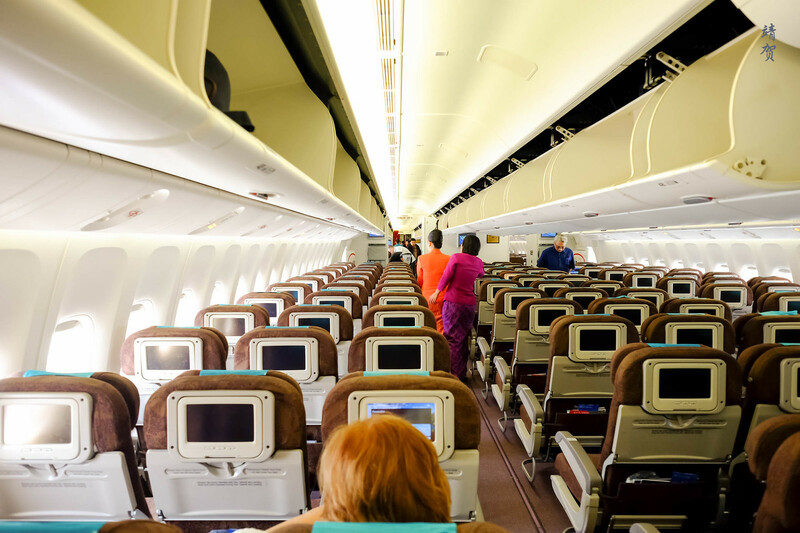 Jakarta to Denpasar Bali is perhaps one of the most common trip reports involving Garuda Indonesia and I have reviewed this exact trip before. 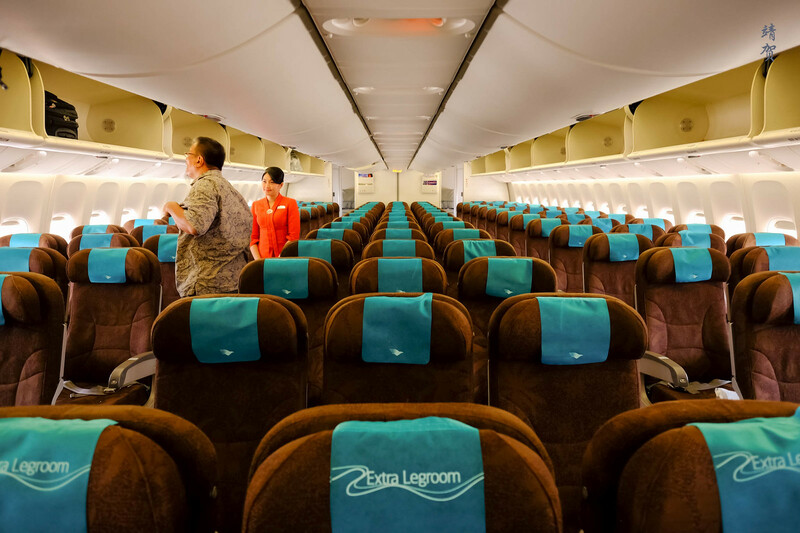 However what makes this special itinerary worth covering is that the flight is served by Garuda Indonesia’s flagship plane – Boeing’s 777-300ER instead of the 737-800 that is normally used on this route. One of the reason could be due to the flight being operated during the National Day long weekend (17 August) which is a popular time for Indonesians to visit Bali. Boarding was by bus as indicated on the display by the gate. 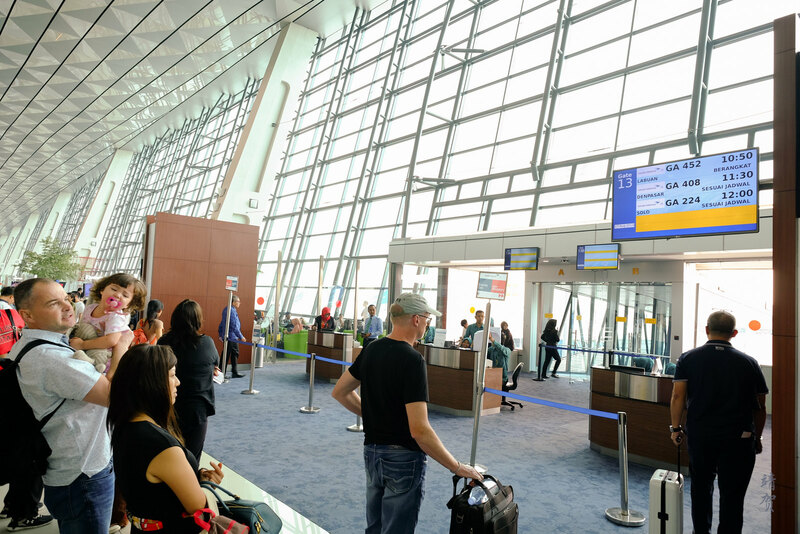 It was a bit chaotic as there was several lines even though the agents were saying one of the lane was for Business Class, Garuda Gold, and Sky Priority only. It turns out the bus was just going to do a drop off at the International Terminal as the plane is parked there. From the alighting point, passengers still need to trek up the stairs and walk a fair distance to board the plane. All of this made no sense whatsoever and the designers of the airport terminal should have found a more elegant workaround to getting to planes parked in the International terminal even if it was for a domestic flight. Upon boarding, the Captain apologized for the delay due to operational reasons, and he went on to talk about the weather in Bali which will be partly cloudy. A flight time of 1 hour and 32 minutes is given. 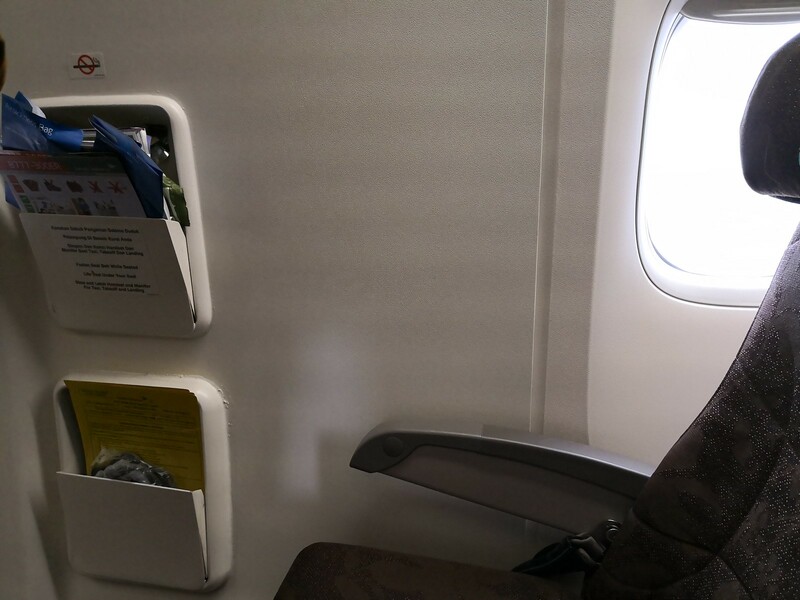 Since I was one of the first to board, I was able to take some photos of the rear cabin where my seat was located. 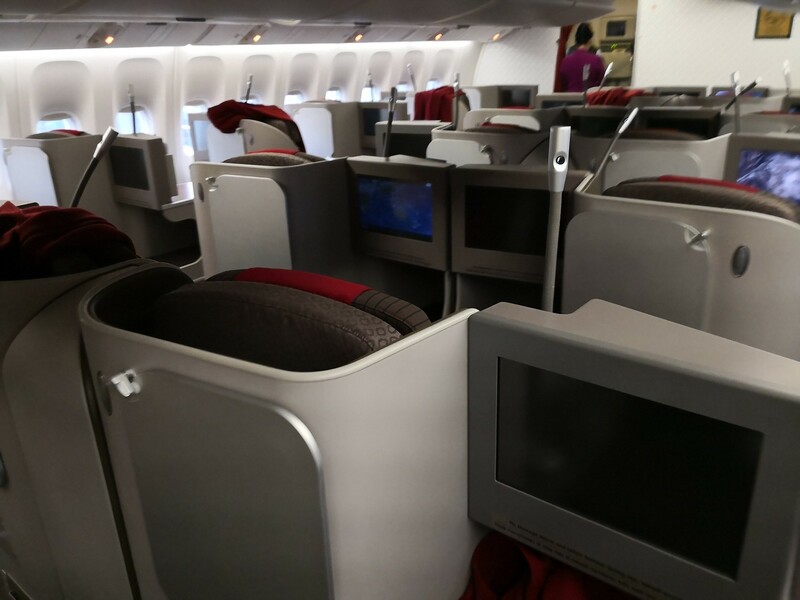 Economy Class on the Boeing 777-300ER was in a 3-3-3 configuration which is one of the best in its class since many airlines have chosen to go with a 3-4-3 configuration. 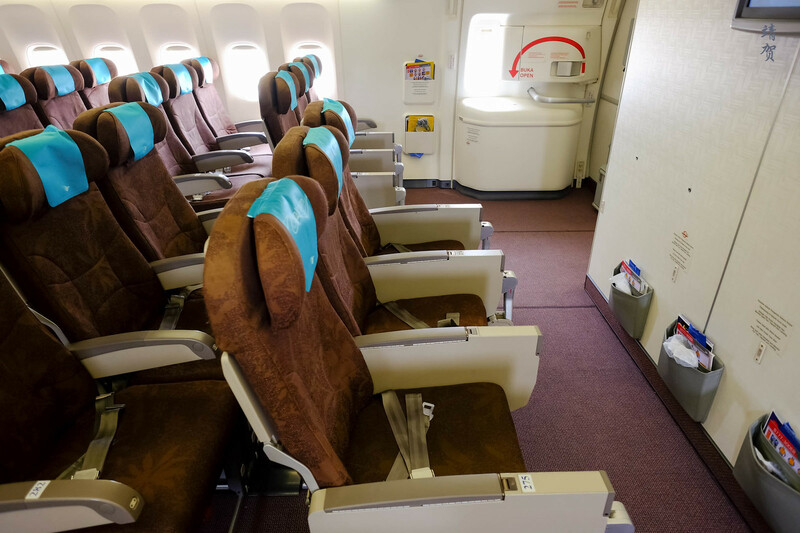 This made the Economy Class on Garuda’s 777 appear more spacious. 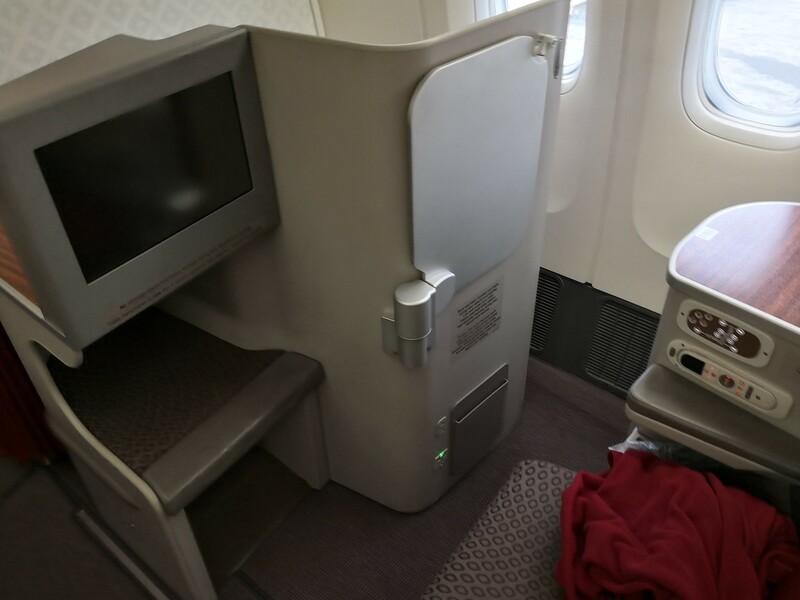 Garuda Indonesia has 2 kinds of 777-300ER configurations – one with a First Class cabin while I was on the newer 777 that has no First Class cabin and just 26 Business Class seats in the front section and 3 sections of Economy Class cabin. While Garuda Indonesia does not have any Premium Economy, I was able to snag one of the Exit Row seats which are classified as extra legroom seats. 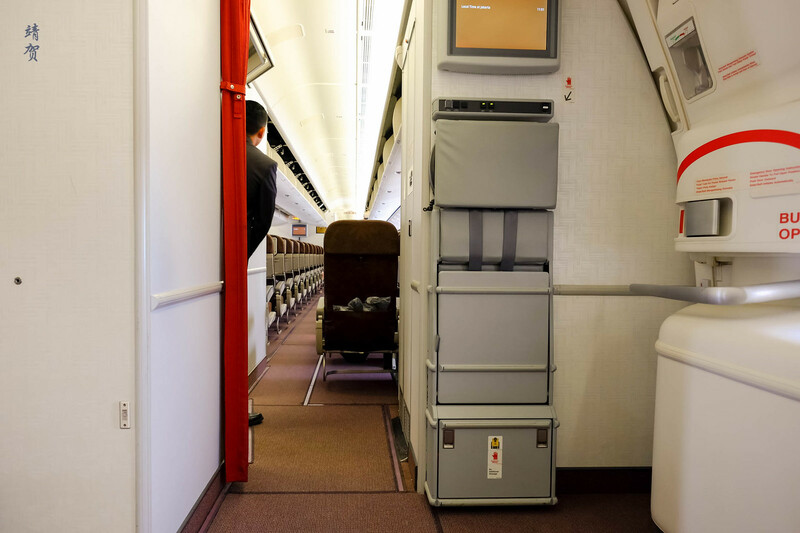 These extra legroom seats would definitely be a plus for the long haul flights that this plane was built for. At the moment, Garuda Indonesia flies the 777-300ER mainly to London, Amsterdam, Shanghai, Tokyo Haneda, Seoul and Jeddah. Boarding for the 777 was surprisingly efficient and this is helped by the fact that the overhead bins on these large wide-bodies have more volume. So it was easy to fit everyone and their luggage. Thanks to another delay that kept us waiting on the tarmac due to busy air traffic, I was able to explore more of the cabin. 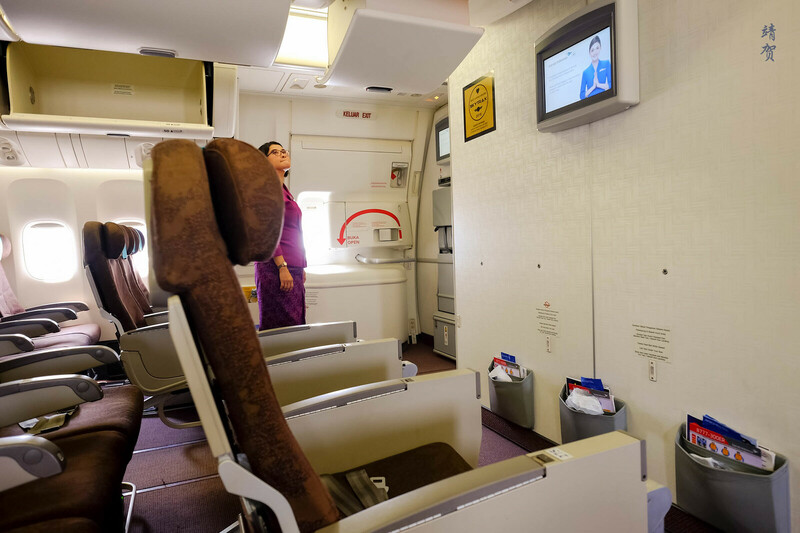 The seats on this plane are all upholstered in a brown fabric and every seat features a moderate-sized personal touch-screen entertainment system, both of which are standard on the 737-800 planes as well. By the time we took off, it was already close to 1pm, which meant a delay of more than an hour. In addition to that, it took a while for meal service to reach my row as one set of crew started from the extreme back and the other started from the front. Being somewhere in the middle, I was one of the last to get my meal. Meal service had the choice of rice with chicken or rice with fish and tofu, as it was verbally communicated by the crew. I picked the former and discovered that the chicken was dry and vegetables was tasteless. As such this made for a lacklustre meal, though I did not have high hopes for it. 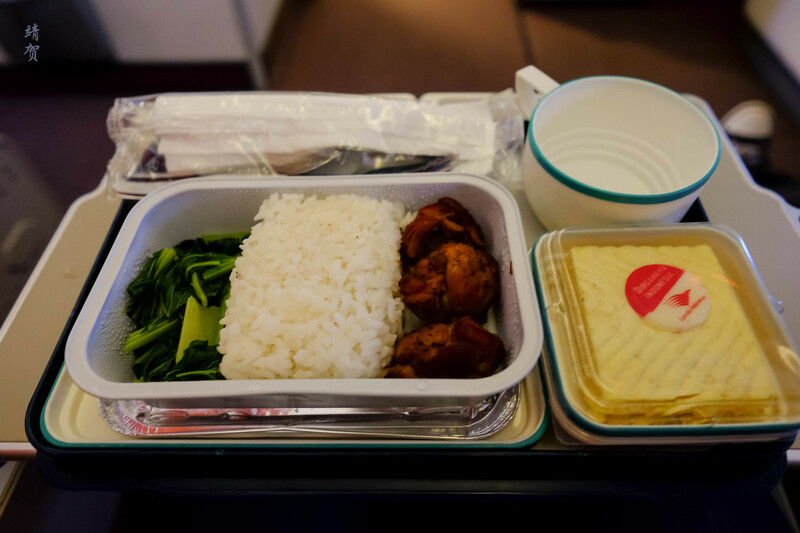 In fact, I have more or less skipped eating inflight food on Garuda’s domestic routes, preferring instead to grab something to eat at the airport or the lounges when I get access. 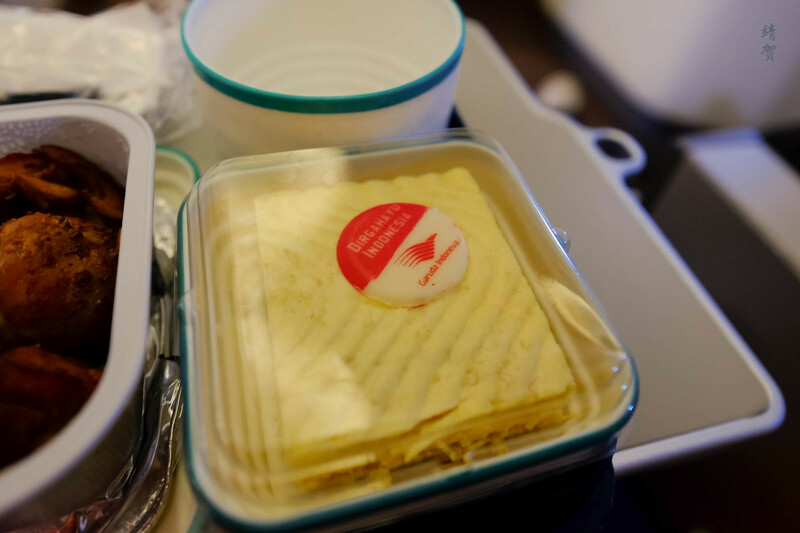 For this flight, dessert served was a cream cake with a chocolate with a red and white chocolate to signify the nation’s flag and a birthday message for the nation. After the meal service, I was expecting a quick descent into Ngurah Rai since this flight rarely takes as much as 2 hours that was blocked for the flight time. However our flight was put on hold in the air due to air traffic congestion in Bali, and this resulted us in having more time to enjoy this larger plane. 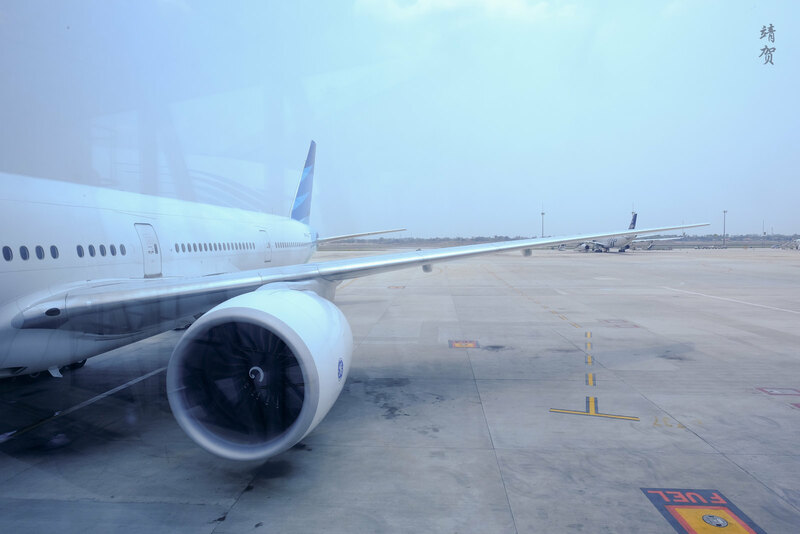 Once we landed in Denpasar Ngurah Rai, however, it was a quick taxi into the gate though the larger plane meant the disembarkation took a bit more time as I was seated at the last section of Economy Class. The use of both front and middle jet bridge did mean I was able to pass through the only Business Class section up front and noticed they installed the staggered lie-flat configuration on this plane.